The Programme for International Reading Literacy assessments found that "number of books at home" was a major predictor of success at school. Reading Together® ensures that schools and families are able to support children's access to, and enjoyment of meaningful text. In 2014 a Select Committee recommended the implementation of RT across all decile 1 -5 schools. Exemplars from Otahuhu and Manurewa demonstrate all the work behind the scenes to ensure high trust is built with families, and successful, high impact implementation. While these videos highlight the spirit, intent and impact of RT, they should not be seen as an alternative to adhering to the detailed workshop content, processes and sequencing. The long-term effect is leveraged through the evidence-informed implementation process explained in the Reading Together®: Workshop Leader's Handbook, associated smart tools, and other resources. The initial implementation of RT at St Joseph's School, Otahuhu is the focus of a case study prepared for the Iterative Best Evidence Synthesis Programme and the Pasifika Schooling Improvement Divisions of the MOE. The report focuses on the principal's implementation leadership. The results of a matched comparison evaluation demonstrated statistically significant gains in children's reading comprehension from new entrant to Year 8 students that were over and above those achieved by the in-school literacy programme, and were evident not only for the focus child but also across siblings in the families who participated. Reading gains were sustained over time. Read the full report Tuck, B., Horgan, E., Franich, C., & Wards, M. (2007). School leadership in a school-home partnership: Reading Together® at St Joseph's School Otahuhu . Wellington: Ministry of Education. More than a decade later, St Joseph's school leadership demonstrates extraordinary expertise and sustainability in high impact implementation. Leaders taking time to find out about the RT Programme and the evidence behind it and getting the buy-in of all staff have been crucial to success. The RT programme is described as 'deceptively simple with sophisticated ideas underpinning it'. "..The fact that the programme was research based held a great deal of importance for us. We weren't about to initiate something that we just thought 'might' make a difference." St Joseph's leadership explain their strategic approach to inviting parents to participate. They made personal approaches for their first series of RT workshops to families they felt would contribute and become future ambassadors for the programme. They explain their framing the RT workshops as being relevant for everyone and avoiding any sense that they are remedial. Attention was given to ensuring the workshops come across as a personal chat and sharing time, with everyone being on a first name basis. The workshops were held in the staffroom with the facilitators sitting with the participants and refreshments provided. St Joseph's school leaders identify the significance of the expert staff facilitators of the RT Workshops being able to communicate how each participant is valued. The facilitators make it safe for candid sharing. Find out more about the evidence for why this matters. The supportive interactions and the workshop process build positive relationships and support amongst the participants. "..Reading Together® is providing parents with some simple strategies to help their children with reading at home, and when reading lifts, everything lifts: their social interactions, their academic performance at school, their love of books..."
This video, filmed at St Joseph's School, Otahuhu, demonstrates how a relationship can be built between the school and parents and caregivers. The trust established becomes the foundation for a reciprocal and enduring relationship between families and school. For many parents and caregivers, just attending is too hard because of childcare challenges. At St Joseph's the principal's office becomes the play room for all the children while their parents attend the RT workshops. "...We're all here to do the same thing, not just the parents but the teachers as well. They want what's best for our children, they want to help us give the best to our children." Workshop facilitators at St Joseph's School, Otahuhu, describe the range of strategies this school uses to reach and include all of their parents and caregivers. The expectation that parents will attend the RT workshops is built into enrolment discussions. Parents hear about the value of the workshops through word of mouth from other parents. "...Even in the shopping centre, just talking to parents, 'How's that reading thing going? Ah good. Are you still managing it four times a week, 10, 15 minutes max per night? Are you doing it with all your children, not just one or two?'" Parents describe many ways in which they have changed their approach to reading with their children. Reading has become a happy time for families. The relationships with school has become a real partnership. "...The fact that we could meet with those senior leaders and have that open door policy; that you could come and speak to them about anything and everything. It really strips away all those barriers so that you can form that partnership between home and school"
'The damage starts when the first book goes home'. This video, at Manurewa Central School, shows how unintended harm can occur when well-intended parents 'help' their children with reading. Principal, Laurie Thew, explains how Manurewa Central makes it safe for parents to learn how to support children's success in reading. The school supports parents and caregivers to support children's learning to great effect. Parents explain how participating in the RT process changes the nature of their established relationship with the school and its leaders. This video outlines the importance of the modelling of how to read with a child at the first RT workshop. This demonstration is a 'light-switch' moment for parents and grandparents. Parents describe their changed practice. The stress level goes down for adults and children. Anxiety is reduced. School leaders explain the effects of this intervention for social wellness. "...It actually promotes social wellness as well. Those relationships that develop over a book are positive feelings provided we take the stress out of the situation, and that's what Reading Together® does." Parents, grandparents and the school leadership explain the deep change the programme has made. This video demonstrates the catalytic effect of the Reading Together® intervention in building educationally powerful connections for learning and wellbeing. "...I was a bit sceptical in the beginning because I thought, how are they going to teach me to teach my kid to read? But I got heaps out of it. Heaps, heaps, heaps." At Manurewa Central the leadership team who facilitate Reading Together® speak of how nothing is assumed or taken for granted as they prepare themselves to welcome new parents into the programme. At this school Reading Together® is used to support the whole "transition to school" process for children, families and teachers. School leaders build relationships with new families that enable teaching to be more responsive to the children. Sustaining families' ongoing access to a rich array of texts is enabled by partnering with community libraries. "...For lots of people, they can make a connection with their librarian once they've been in a few times and we get to know what they like, and we're able to make recommendations for people, but that relationship has to be built first, and that's why the Reading Together® programme is so good, because we get to connect with people who perhaps wouldn't have the confidence to step inside the doors to start off with." Leaders have classroom teachers going through the Reading Together® Programme so that they deepen their understanding of how they can optimise support for their learners and strengthen relationships with whānau. Children's access to the right books at the right time is paramount and the teachers follow up to make sure this happens. At Manurewa Central Reading Together® has been a catalyst for building a literate culture. Everyone - leaders, teachers, parents, families, whānau and children - are working together to build literacy. 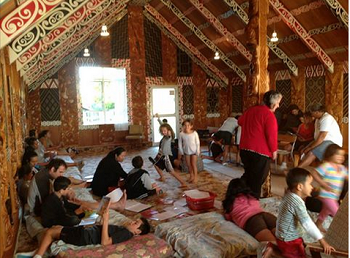 Fairhaven School in Te Puke has been implementing Te Pānui Ngātahi (Reading Together® programme) at Ngati Moko Marae since 2014. "…These workshops have been truly fantastic. ... we have presented these workshops bilingually. We have given whānau mini-libraries to take home with books in English and Te Reo Māori. We have also modeled most parts of the workshops in Te Reo as well as English, including reading with a child, and reading from a dictionary. The small amount of funding that is required to make these workshops happen is minimal in comparison to the social value that they provide. The feedback that we have had from whānau has been heartwarming, how, with support from these workshops, we are changing negative experiences from the past to a positive experience for the future." Chapter 7 Creating educationally powerful connections..
School leadership in a school-home partnership..
Planning for the first meeting..